Airports (ARP) — plans and develops projects involving airports, overseeing their construction and operations. Ensures compliance with federal regulations. National Airspace System. ATO employees manage air traffic facilities including Airport Traffic Control Towers (ATCT) and Terminal Radar Approach Control Facilities (TRACONs). See also Airway Operational Support. Aviation Safety (AVS) — Responsible for aeronautical certification of personnel and aircraft, including pilots, airlines, and mechanics. Commercial Space Transportation (AST) — ensures protection of U.S. assets during the launch or reentry of commercial space vehicles. The FAA provides air traffic control services over U.S. territory as well as over international waters where it has been delegated such authority by the ICAO. This map depicts overflight fee regions. Yellow (enroute) covers land territory, excluding Hawaii and some island territories but including most of the Bering Sea as well as Bermuda and The Bahamas (sovereign countries, where the FAA provides high-altitude ATC service). 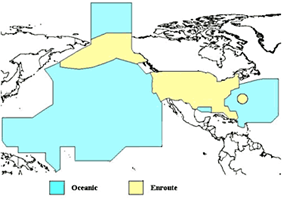 The blue regions are where the U.S. provides oceanic ATC services over international waters (Hawaii, some US island territories, & some small, foreign island nations/territories are included in this region). In fulfilling its civil aviation responsibilities, the Department of Commerce initially concentrated on such functions as safety regulations and the certification of pilots and aircraft. It took over the building and operation of the nation's system of lighted airways, a task initiated by the Post Office Department. The Department of Commerce improved aeronautical radio communications and introduced radio beacons as an effective aid to air navigation. President Franklin D. Roosevelt split the authority into two agencies in 1940, the Civil Aeronautics Administration (CAA) and the Civil Aeronautics Board (CAB). CAA was responsible for ATC, airman and aircraft certification, safety enforcement, and airway development. CAB was entrusted with safety regulation, accident investigation, and economic regulation of the airlines. The CAA was part of the Department of Commerce. The CAB was an independent federal agency. By the mid-1970s, the agency had achieved a semi-automated air traffic control system using both air traffic controllers union in 1981 forced temporary flight restrictions but failed to shut down the airspace system. During the following year, the agency unveiled a new plan for further automating its air traffic control facilities, but progress proved disappointing. In 1994, the FAA shifted to a more step-by-step approach that has provided controllers with advanced equipment. In 2007, two FAA whistleblowers, inspectors Charalambe "Bobby" Boutris and Douglas E. Peters, alleged that Boutris said he attempted to ground Southwest after finding cracks in the fuselage, but was prevented by supervisors he said were friendly with the airline. This was validated by a report by the Department of Transportation which found FAA managers had allowed Southwest Airlines to fly 46 airplanes in 2006 and 2007 that were overdue for safety inspections, ignoring concerns raised by inspectors. Audits of other airlines resulted in two airlines grounding hundreds of planes, causing thousands of flight cancellations. The House Transportation and Infrastructure Committee held hearings in April 2008. Jim Oberstar, former chairman of the committee said its investigation uncovered a pattern of regulatory abuse and widespread regulatory lapses, allowing 117 aircraft to be operated commercially although not in compliance with FAA safety rules. Oberstar said there was a "culture of coziness" between senior FAA officials and the airlines and "a systematic breakdown" in the FAA's culture that resulted in "malfeasance, bordering on corruption." In 2008 the FAA proposed to fine Southwest $10.2 million for failing to inspect older planes for cracks, and in 2009 Southwest and the FAA agreed that Southwest would pay a $7.5 million penalty and would adopt new safety procedures, with the fine doubling if Southwest failed to follow through. In December 2000, an organization within the FAA called the Civil Air Navigation Services Organisation. On October 31, 2013, after outcry from media outlets, including heavy criticism  from Nick Bilton of The New York Times, the FAA announced it will allow airlines to expand the passengers use of portable electronic devices during all phases of flight, but mobile phone calls will still be prohibited. Implementation will vary among airlines. The FAA expects many carriers to show that their planes allow passengers to safely use their devices in airplane mode, gate-to-gate, by the end of 2013. Devices must be held or put in the seat-back pocket during the actual takeoff and landing. Mobile phones must be in airplane mode or with mobile service disabled, with no signal bars displayed, and cannot be used for voice communications due to FCC regulations that prohibit any airborne calls using mobile phones. If an air carrier provides Wi-Fi service during flight, passengers may use it. Short-range Bluetooth accessories, like wireless keyboards, can also be used. In July 2014, in the wake of the downing of Malaysia Airlines Flight 17, the FAA suspended flights by U.S. airlines to Ben Gurion Airport during the 2014 Israel–Gaza conflict for 24 hours. The ban was extended for a further 24 hours, but was lifted about six hours later. The FAA has been cited as an example of regulatory capture, "in which the airline industry openly dictates to its regulators its governing rules, arranging for not only beneficial regulation, but placing key people to head these regulators." Retired NASA Office of Inspector General Senior Special Agent Joseph Gutheinz, who formerly was a Special Agent with both the Office of Inspector General for the Department of Transportation and FAA Security, is one of the most outspoken critics of FAA. Rather than commend the agency for proposing a $10.2 million fine against Southwest Airlines for its failure to conduct mandatory inspections in 2008, he was quoted as saying the following in an Associated Press story: "Penalties against airlines that violate FAA directives should be stiffer. At $25,000 per violation, Gutheinz said, airlines can justify rolling the dice and taking the chance on getting caught. He also said the FAA is often too quick to bend to pressure from airlines and pilots." Other experts have been critical of the constraints and expectations under which the FAA is expected to operate. The dual role of encouraging aerospace travel and regulating aerospace travel are contradictory. For example, to levy a heavy penalty upon an airline for violating an FAA regulation which would impact their ability to continue operating would not be considered encouraging aerospace travel. In September 2009, the FAA administrator issued a directive mandating that the agency use the term "customers" only to refer to the flying public. Company DERs act on behalf of their employer and may only approve, or recommend the FAA approves, technical data produced by this company. Consultant DERs are appointed to act as independent DERs to approve, or recommend the FAA approves, technical data produced by any person or organization. ^ Offices. Faa.gov (2013-05-24). Retrieved on 2013-07-12. ^ Airports. Faa.gov (2012-01-05). Retrieved on 2013-07-12. ^ Air Traffic Organization. Faa.gov (2013-02-05). Retrieved on 2013-07-12. ^ Aviation Safety (AVS). Faa.gov (2013-04-29). Retrieved on 2013-07-12. ^ Office of Commercial Space Transportation. Faa.gov (2013-06-25). Retrieved on 2013-07-12.